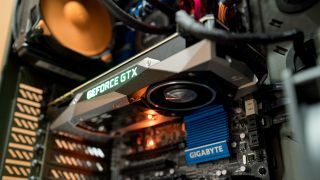 Nvidia's new Pascal-based graphics cards have got a big thumbs-up, generally speaking – and certainly from our expert reviewers – but there's a new Titan offering in the pipeline which will apparently blow away the GTX 1080, and it'll be launched as soon as next month. Yes, the GeForce GTX Titan P will apparently be revealed at the Cologne-based Gamescom show in August, and it will be built on the GP102 chip. And the Titan will be no less than 50% faster than the GTX 1080, so the whispers on the graphics grapevine claim. That's some pretty awesome performance right there – because let's face it, the 1080 is hardly a slouch. As we noted in our review, it can handle 4K gaming quite nicely in most titles provided you're willing to tweak down your anti-aliasing settings a bit (and at 4K resolution, that's not so much of a sacrifice). With the new Titan, fluid 4K gaming should definitely be a reality, then, and it's your CPU that will be the potential frame-rate bottleneck rather than the GPU. There will apparently be two versions of the Titan P, one with 12GB of memory and the other boasting 16GB (both will use HBM2 memory). The only other question is just how much damage these beasts will do to your wallet, but you can bet the tag will be pretty eye-watering, particularly given the asking price that the GTX 1080 Founder's Edition has been pitched at (which is one of the few downsides of the card).